University of Maryland scientists have created a rubber actuator that is less than a millimeter long. Mechanical engineers Sarah Bergbreiter, Aaron Gerratt, Bavani Balakrisnan and Ivan Penskiy used an inventive micro-molding process, in which a rubber mixed with conducting nanoparticles is poured into trenches etched in a silicon wafer. 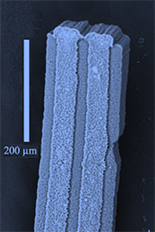 When finished, the component for microdevices is 1 mm long and about the width of a human hair --- just 100 microns wide. It has three layers that conduct electricity and as different voltages are applied, the lever can move in different directions. The new device can bend up and down, sometimes as far as one third its length. The actuator is also incredibly robust because the material it is made of is both elastic and slightly squishy. The engineers' other advance is that the device only sips energy: the voltage needed is significantly less than other actuators of this type, and only 10 µW of power is needed to drive the device. The research was published in the journal Smart Materials and Structures in March 2013.